The thing I hate most about Facebook as a host for our group is that the now thousands of posts are presented linearly – no feature to allow the user to group posts by topic (e.g., as one would in a discussion forum), to create a chain/thread of related posts, or to easily/quickly access posts from last month or last year. Fortunately, if one is sufficiently lucky and patient and has a reasonably good memory, it may be possible to find an old post using the FB group “Search” feature. Unfortunately, a search often does not unearth the much sought-after post. So I decided to create this blog post, highlighting some of the posts, videos, photos, bootlegs, etc. shared in 2017. I hope that you find it useful, but mostly I did this for myself 🙂 …..
Only a few here, because most “memorable” posts shared a video, photo, whatever. We finally received some news about the Dust Radio documentary! Stefan Tomas Lien encouraged us to think of Chris lyrics as band names – lots of fun! A little bit about the Chris/Bob Dylan connection. A “most of us missed it” post by Hiroshi Suda, sharing audio of a radio broadcast of Dirt Floor tunes on Internet Radio show – J’Open Mike (1998-03-10). To ensure that we don’t forget …. Tom Jones posted what I took to be a promise to share some of his newly-unearthed bootleg collection with us. Metter Bozze (Maarten Demetter) lit up the group when he posted “look mommy what I found” and a link to a YT video of Chris’s full show from 1991-10-08 (Nassau Coliseum, Uniondale, NY). Thanks, Maarten! Metter also reposted the video of Chris and the Brides of Jesus at the John Campbell Tribute (NYC 1993-08-06). Original post and comments here. Two high-5’s to Maarten! The first post of new member Michael Moore also lit up the group: his almost 20-year-old video, captured from a broadcast on the TV station where he worked, of Chris singing Scrapyard and Dirt Floor. Hiroshi Suda reposted video of “Be Here Now,” Ashville, NC 1999-05-13. Original post with all comments is here. Hiroshi also reformatted and uploaded the video of Chris and the Terra band at Rosebud Cafe Pittsburg, PA 1997-05-13. This set had originally been on You Tube for years, but suddenly disappeared. As this was a favorite of several ATCW members, we are grateful for Hiroshi’s efforts! And, in a perfect trifecta, Hiroshi also posted a short clip of the Vast Combo at Quasimodo’s. On what would have been Chris’s 57th birthday, Jeff Lang posted a video in remembrance: photos/video of the recording of Dislocation Blues with “Stagger Lee” as the soundtrack. I shared an extracted video of Chris, recently arrived in Belgium, playing who knows what song but giving it his all. Original post by Ozu Has (who first found and shared the video) here. Also, don’t miss the many photos that Adrian Adioetomo shared of Chris in Sydney, Australia October 1993 (gig pix at The Basement) and in NYC 1996 (gig pix at CBGBs and The Knitting Factory). Hiroshi shared some new pix from the Tom Tom Club 2001-03-20. In addition, some bootlegs that couldn’t be uploaded to the LMA were made available on Katie’s cloud drive. The various transcriptions, tunings, tabs, etc. of Chris’s catalog were collected in one place. Hey Katie! 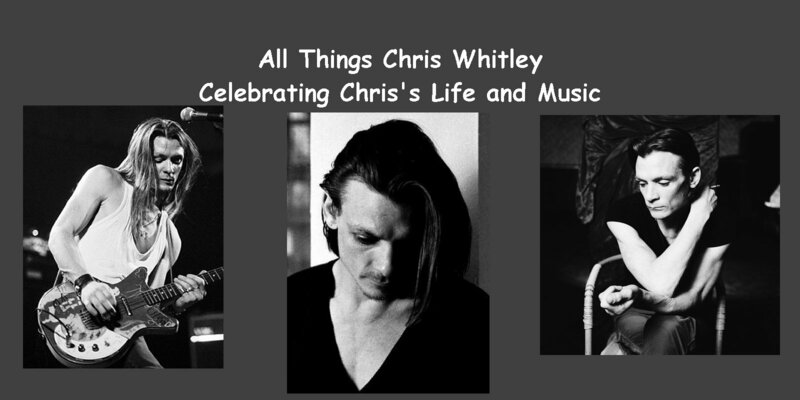 Thanks a ton for this site, I appreciate all the work you put into keeping Chris’ legacy alive. I’m not on Facebook so I can’t see the group links, so I was wondering what news about the Dust Radio Documentary. I don’t see anything on their main website nor their public Facebook page (which does not require a login). Was wondering if you could pass it on to the few of us who follow you here and not on facebook. Thanks, Dave. Re the doc, Dan Whitley and a friend who knows film editing have taken control of the project. 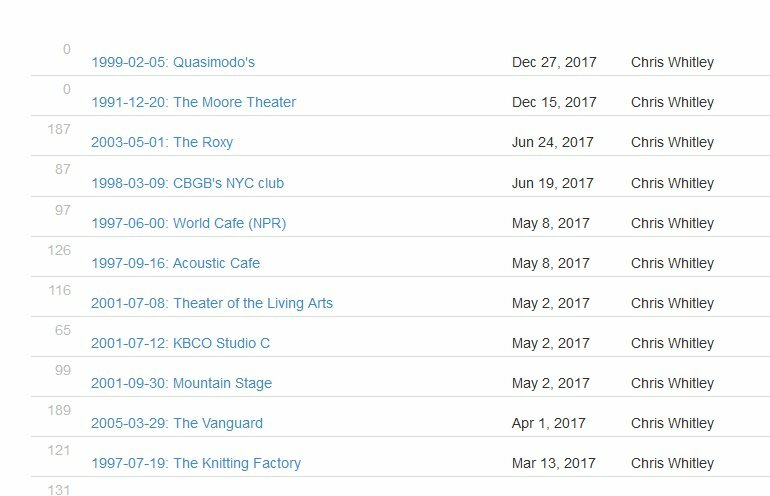 Latest news indicates that there may be a screening in NYC yet this winter. Currently, the plan is to release a link to the ATCW group sometime in 2018 so that we can watch it online.